Precious metals futures declined sharply this week. Gold was alone with gains on Friday, rebounding from its lowest price of the year, but the yellow metal still dropped on the week to mark its fourth weekly decline in five weeks. Gold for June delivery on Friday rose $1.90, or 0.15%, to settle at $1,291.30 an ounce on the Comex division of the New York Mercantile Exchange. "With the dollar heavily supported by positive economic data and [interest] rate hike expectations, zero-yielding gold is likely to remain vulnerable to heavy losses," MarketWatch quoted Lukman Otunuga, research analyst at FXTM. "While geopolitical tensions and uncertainty could offer some support, price action shows that bears remain firmly in control," he added. Gold futures traded 2.2% lower this week after rising 0.5% last week when they logged their first weekly increase in four weeks. On Thursday, they settled at their lowest price since Dec. 26. With this week’s loss, the precious metal is now 1.4% lower on the year to date. "Sixteen market professionals took part in the survey. 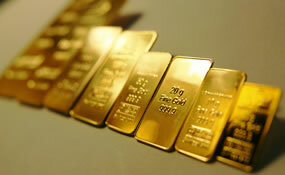 There were seven votes each, or 44%, calling for gold prices to rise and fall over the next week. Two voters, or 13%, see prices unchanged or sideways. Meanwhile, a smaller-than-normal 605 voters responded in an online Main Street survey. A total of 296 respondents, or 49%, predicted that gold prices would be lower in a week. Another 241 voters, or 40%, said gold will rise, while 68, or 11%, see a sideways market." Elsewhere, silver for July delivery shed 2.6 cents, or nearly 0.2%, to settle at $16.455 an ounce. Silver futures fell 1.8% this week after two weekly gains of 1.4% and 0.7%. They are 4% lower on the year. July platinum declined $5.60, or 0.6%, to $886.50 an ounce, for a 4.3% weekly drop. Palladium for June delivery fell $17.30, or 1.8%, to $960.20 an ounce, for a 2.5% weekly loss. Both metals are down on the year with declines of 5.5% for platinum and 9.5% for palladium. Gold declined $1.20, or 0.1%, to $1,288.30 an ounce. Silver rose a half penny, or less than 0.1%, to $16.39 an ounce. Platinum fell $6, or 0.7%, to $884 an ounce. Palladium declined $10, or 1%, to $981 an ounce. In weekly LBMA results, the losses reached 2.7% for gold, 2.2% for silver, 4.5% for platinum and 2.3% for palladium. Gold bullion coins advanced by 11,500 ounces this week after they climbed by 6,500 ounces last week. Splits included 6,000 ounces in American Gold Eagles against 2,000 ounces previously and 5,500 ounces in American Gold Buffalos against 4,500 ounces previously. American Silver Eagles rose by 100,000 coins, doubling last week’s total. Sales of five-ounce silver bullion coins were muted for a fourth straight week. 2018 American Platinum Eagles rose by 10,000 coins for their first gains in a week since the one ended Feb. 16.